Jamie Pyke, son of both a slave and master of Tall Oakes, has a deadly secret that compels him to take a treacherous journey through the Underground Railroad.
" If Dickens had been an American he might have written such a novel as this, a story with all the elements of a classic, family secrets, the struggle of an orphan to affluence and prominence, a quest for love, plus miscegenation, and escape from slavery. This exciting story of danger, fear, cruelty, loyalty, and enduring love, brings alive some of the worst in our history, and some of the best. "Grissom’s writing is authentic, and it is also full of sensitivity, compassion and an encompassing sense of respect for the people whose story she is seeking to tell." 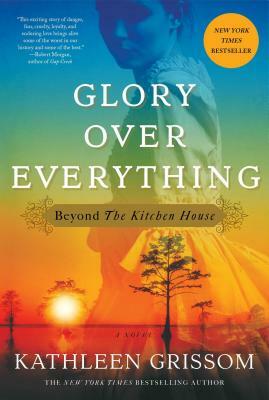 "Compelling...engaging...Like The Kitchen House, Glory over Everything will appeal to readers who appreciate a thought-provoking historical drama, making it a good selection for book clubs as well." "A gripping tale filled with vivid characters....Grissom is a superior storyteller."